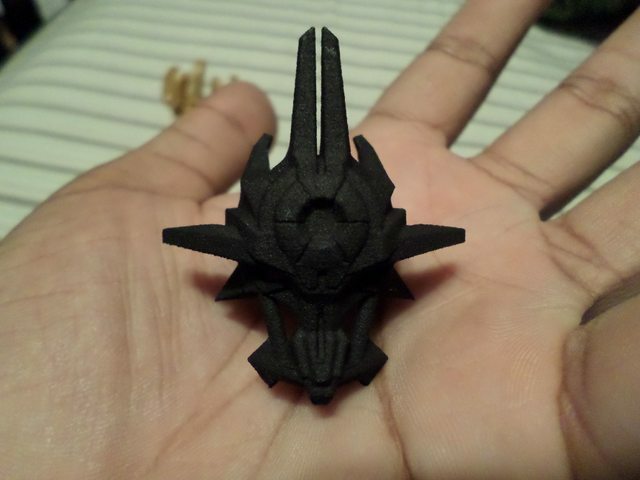 By now I'm sure a lot of you know that someone made a Mask of Ultimate Poweron Shapeways . The design is by Cyberhand. 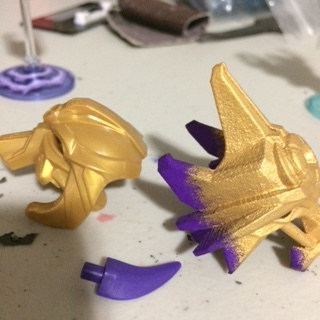 TLDR; Which version of the shapeways mask of ultimate power is roughly the same size as the Mask of Creation and Mask of Control. "Both of them fit onto the G2 heads. I just made a small change to them in order to make one bigger than the other, the clips remained the same size though. 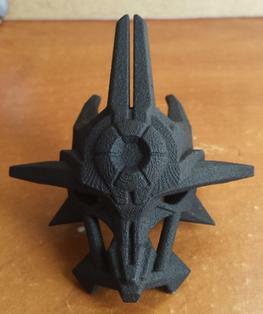 The reason one is bigger than the other is because the mask seen in the Makuta contest video is designed to fit well on the model and be bigger than all the other masks." Based on this quote, I'd assume the villager sized one is best to scale with the MoCr and the MoCo, but the titan one is (obviously) for those building the titan Makuta. 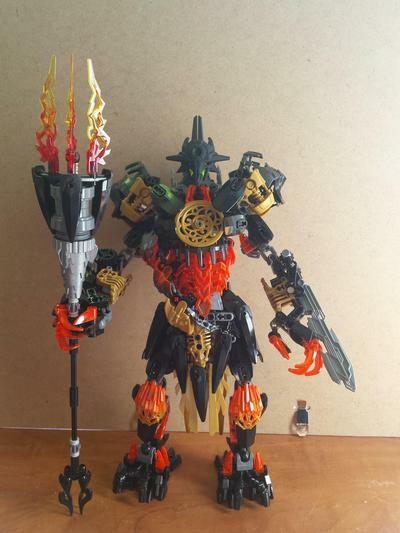 Since I'm both building the titan and want it to scale with the others, I'm wondering if anyone can share any pics of either one on the built titan or next to the other two Great Masks so I can judge... Thanks! Well I sent him a note on his deviantart page. And he told me the villager sized one is roughly the same size as the Mask of Creation and Mask of Control. So I ended up buying that one. The Matte Gold smaller Moup was 40 dollars cheaper so I should be happy with it. Though according to someone who bought a metal version. It won't come off a head if you put the mask on. At least not easily. 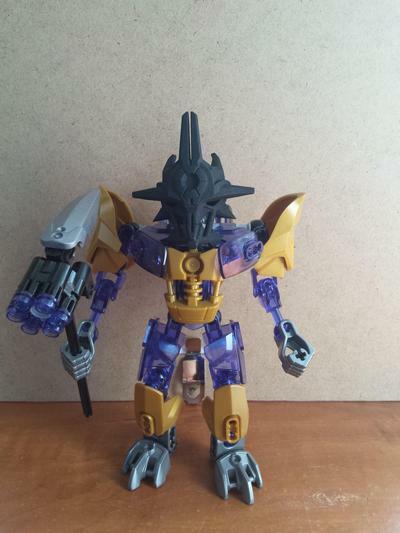 I know there's actually one more guy working on a version that should be up on shapeways in the next few weeks and looks to be even more accurate than the versions out there right now, so I'd wait just a little bit longer, personally. Thanks for the info. Could you let us know when it's up? While I would like to see what this new Moup would look like. I don't think I can cancel my Shapeways order now. I'll settle for the one cyberhand made. I am watching all these MOUP projects closely. 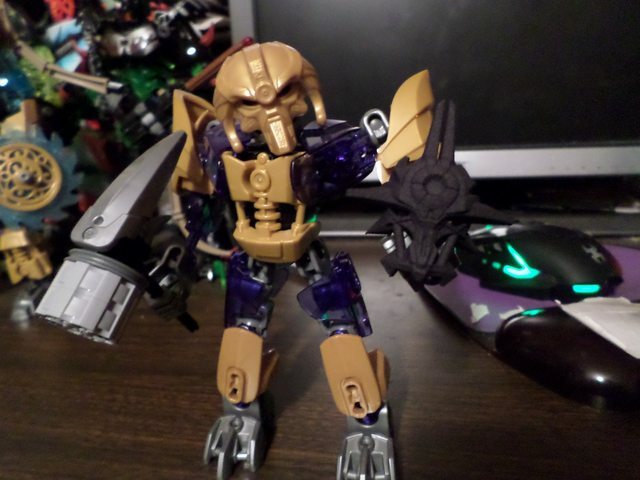 I hope to someday build the Makuta Titan model, but in the meantime I would settle for just the mask in my hands. 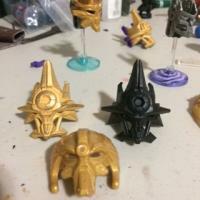 Does anyone have photos of the metal masks when finished? I'll be sure to post photos when I get my version. 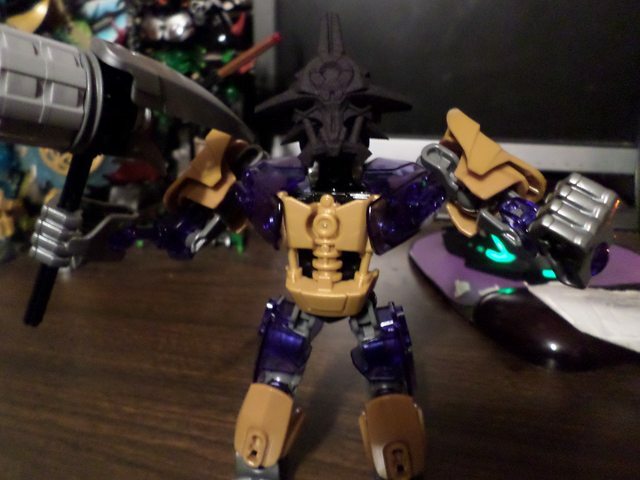 Though it won't be on a g2 head as I don't want it to get stuck on it. But I will post a picture of it with the Mask of Control and Mask of Creation. 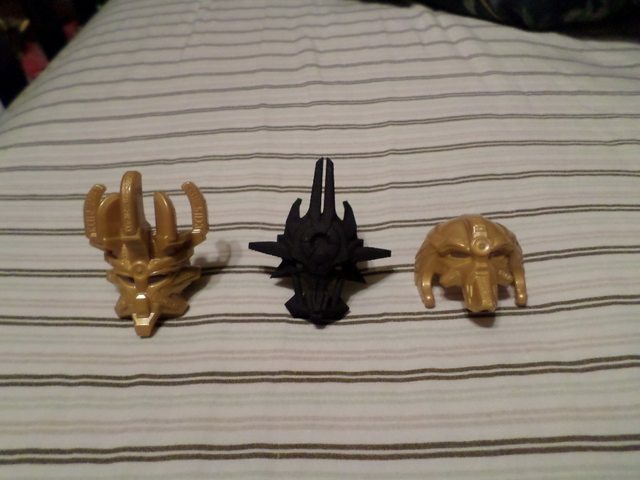 I have about 20-25 spare G2 heads (gifted from a Lego employee after the building event in stores ended), but I'm not sure if I want to spend the money on a metal one... 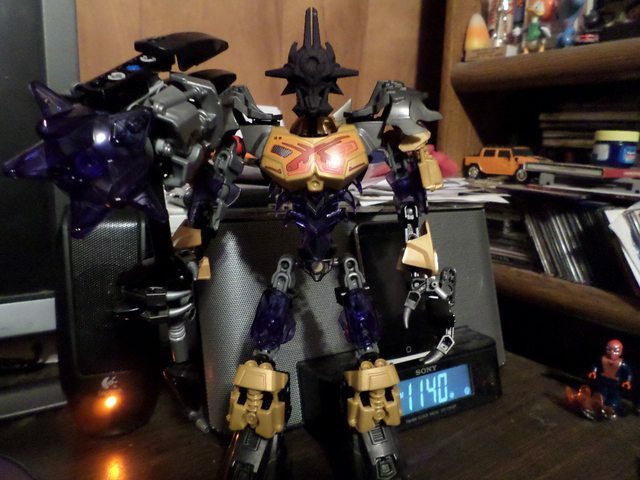 I'll definitely order a black one for the Makuta combi model, but still on the fence about metal. My MoUP came in today, and it's pretty nice looking in hand. I'm glad that I chose to buy the villager scale version in matte gold. I might get the titan version as well but in black strong and flexible plastic. But I think i'll wait till the one Dorek mentioned is available. Beautiful. I'd love to get my hands on both versions! That looks fantastic. 1) Does it come in non-matte i.e. gloss, and 2) how sturdy is it? Is it as solid as a Lego-produced mask? I have both masks as well, One in black, a villager sized one in gold plated steel, and a villager sized in purple.There isnt a black polished,but the polished is still pretty rough anyway, but the material is pretty strong. both versions of the mask are really thick, so not too worried about breakage. I've found gloss black spray paint and a matte coat work well to replicate lego's black, the purple is already the right color. Finally citadel's auric gold (https://www.games-workshop.com/en-WW/Citadel-Layer?s=99189951062) is spot on for lego's color of gold, but it works best with a layer of paint underneath it, gold spraypaint works well for an undercoat. The metal one is on the upper left. I'd like to add that the villager size fits on the head a little bit better, and has a working eject function. Neat so your metal one hasn't gotten stuck to the g2 heads I take it? Also is the titan one metal as well? no, sorry if I was unclear, the metal just doesnt fit. I tried attaching it, had to remove the head with pliers. its villager sized. As I have a mask stand built for my metal Moup.